Ben Heckendorn and eDimensional have teamed up once again and created the Access Controller compatible with the Playstation 2, Playstation 3 and PC platforms. Allowing total control of games with one hand, the Access Controller represents a completely new way to play all of your favourite games. This unique modular design allows the user to customize the placement of the controllers (analog sticks, D-Pad, shoulder buttons, face buttons, etc.) to that which best fits their playing style or a particular game. Modules can be removed and replaced easily with the use of only one hand. 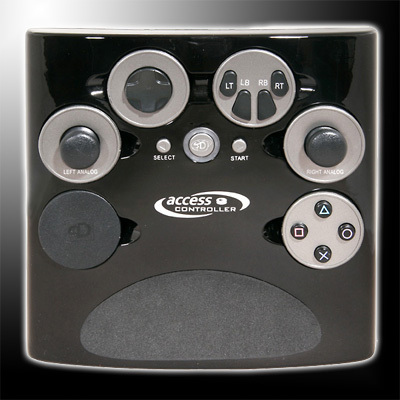 Originally designed to enable people without the use of both hands to participate in many of the popular games, the Access Controller is designed with a concave bottom which enables it to rest comfortably on a leg or it can be placed on any flat surface. Rubber feet keep it stable so it doesn't move while you play. The recessed and padded palm rest lets your hand sit in comfort. Because it utilizes 2.4 GHz wireless connectivity you have freedom of movement without cluttering cords. The wireless dongle is compatible with PS2 and PS3/PC (using the included adapter). The Access Controller even comes with (3) AA batteries to get you in the game right out of the box. For those advanced users with technical knowledge you can consider developing your own custom modules and accessories with the accompanying detailed documentation or visit www.benheck.com for more advanced information. The Access Controller comes with a one-year warranty against defects (failure due to modifications will not qualify as a defect). Note: Our testing has shown that this product is not compatible with PS3 and PC platforms. Product is sold as-is, with no warranty or return policy.